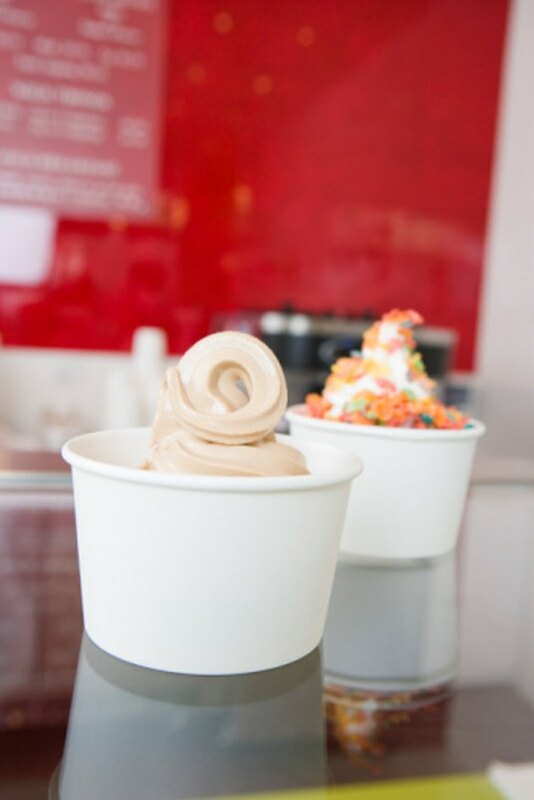 Mochi yogurt is a frozen treat that you can personalize by flavor and topping choices. You may fill a 4-oz. container with yogurt in a flavor such as green tea, coconut, strawberry, taro and mango. Then sprinkle a combination of your favorite toppings -- such as almonds, chocolate chips, M & M’s, fruit or graham crackers. You pay for your creation by the ounce, explains the Mochi website. For each 4-oz. container serving of Mochi yogurt, there are 110 calories. Mochi yogurt is non-fat and free of cholesterol. Carbohydrate count is 24 g or 8 percent of the daily value, or DV. Sugars amount to 22 g, according to Mochi yogurt nutritional information. Mochi yogurt contains active live cultures and is rich in probiotics, which have numerous health benefits such as improved digestion. Sodium content in Mochi yogurt is 30 mg or 1 percent of the DV. Mochi yogurt has 3 g of protein and no dietary fiber. A source of calcium, Mochi yogurt supplies 8 percent of the calcium DV, based on a 2000-calorie diet. The total number of calories by size will depend entirely on how you top your 4-oz. frozen yogurt. For example, if you add 1 tbsp. of chopped almonds, you will add 16 calories. By adding 1 oz. of diced mango, you add 18 calories. That would bring the total calories to 128 for 5 oz. of dessert. The addition of 1 oz. of strawberries will add nine calories. A tbsp. of M & M’s adds eight calories. A sprinkling of about 1/8 cup of coconut topping adds 34 calories.